With just under a month to go until the MLS All-Star game, PRO have announced the officials that will be on duty for the annual showcase event. On Thursday July 28, the league’s finest players will go head-to-head with English giants Arsenal – runners-up in the Premier League last season. In charge of proceedings will be referee Chris Penso, who has been prominent in the MLS middle this year. The 34-year-old was fourth official for both the MLS Cup and U.S. Open Cup in 2015. 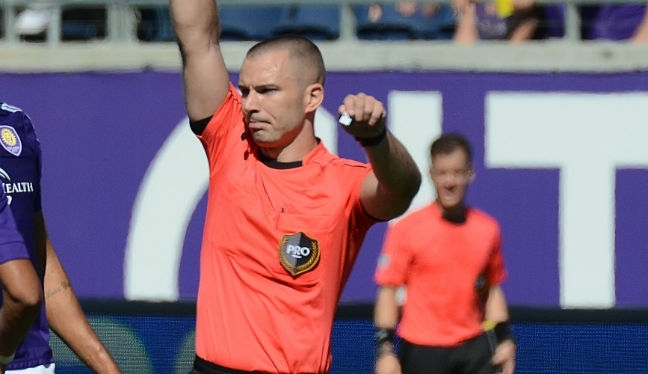 Joining Penso at San Jose Earthquakes’ Avaya Stadium will be assistant referees Frank Anderson and Matthew Nelson. Anderson has vast experience, taking charge of well over 150 MLS games in his career, and is one of the most-assigned ARs in 2016. Fellow AR Nelson reached the 50-game MLS career milestone in Week 3, having made his league debut in 2012. Juan Guzman, who refereed the 2013 U.S. Open Cup Final, will be on fourth official duties, while the vastly experienced Chris Strickland – an AR who has officiated in MLS since its inception – completes the crew for the 21st All-Star game as the reserve assistant referee.